Oats are cheap and easy to prepare and when done right, they are delicious. A bowl of oatmeal will keep you satisfied longer and won’t cause the blood sugar rush that so many sweetened cereals do. Oatmeal is so much more than a tasty, warming breakfast meal. Oats are naturally high in fiber, which helps keep blood-sugar levels stable and naturally lower cholesterol and rich in minerals like magnesium, antioxidants and B vitamins, which are essential for converting carbohydrates into energy. Rolled Oats or Old-Fashioned Oats: are oats that have been rolled and flattened into flakes so they cook in just 5 to 10 minutes. Quick Cooking or Minute Oats: are rolled oats that are chopped into smaller pieces so they cook in about 1 minute. They also are a great replacement for bread crumbs in recipes like this yummy Paula Deen meatloaf. Instant Oats: are oats that have been rolled even thinner and finer so they cook in seconds. They are usually pre-flavored and full of sugar, so they’re not the best choice when you want to eat healthier and lose weight. Look for a low sugar variety for when you are pressed for time. Steel Cut Oats: are also known as Irish oatmeal or Scottish oats. They have been cut into pieces instead of rolled and have a hearty, nutty taste and texture, but take longer to cook – about 30 minutes. You can shorten the cooking time to 5 to 10 minutes by soaking them overnight. I’ve always liked oatmeal, but have really come to love it now that I’ve discovered steel-cut oats. They have a much chewier, nuttier flavor that is satisfying and delicious. The only downside is that they take about 30 minutes to cook, which can be difficult to deal with on a busy weekday morning. Here’s a recipe for slow cooker multi-grain cereal and one for slow cooker pumpkin pie oatmeal and another for slow cooker eggnog oatmeal that all use steel-cut oats. But there are ways to solve the long cooking time issue. Here are three things you can do. Cook up a big batch during the weekend and then store them in the fridge for re-heat during the week. Cook them overnight in your slow cooker. Soak them overnight so that your cooking time is reduced to just 5 minutes. To make 4 servings of overnight oatmeal, place 4 cups water and 1 cup steel cut oats in a medium saucepan and set it aside to soak overnight. When you’re ready to cook, add 1/4 teaspoon salt and place the pan over medium heat and cook, stirring often, for 5 to 7 minutes. Cover, turn off heat and let sit for 5 minutes. Then serve with your favorite slim & healthy toppings and milk if desired. Each serving has about 160 calories and *4 WW PointsPlus Value. To make 2 servings of old-fashioned oatmeal, combine 2-1/4 cups water, 1 cup old-fashioned rolled oats and a dash of salt in a small saucepan set over high heat. When the water boils, turn the heat down to low and cook, stirring until the water is just absorbed, about 5 minutes. Add a little butter to taste, if desired, cover the pan, turn off the heat and let sit for 5 minutes. Uncover and stir then stir in any other ingredients you desire and serve. Each serving has 160 calories and *4 WW PointsPlus Value. Cooking Notes: This recipe makes a fairly creamy oatmeal. If you like your oatmeal thicker, use a little less water. In addition to oats, you can cook any kind of rolled or flaked grain this way. If your oatmeal’s thicker than you’d like, which can happen as it sits in the refrigerator, a tasty way to thin it out is with a little skim milk, non-dairy milk substitute or thick, creamy Greek yogurt. Cook on high for 1 minute, then stir well. Cook on high for 30 seconds, and stir again. Repeat in 15-second increments until your oatmeal is cooked the way you like it and water fully absorbed. Stir in 1 tablespoon peanut butter and serve. When made with regular peanut butter each serving has 169 calories, 9 g fat, 17 g carbs, 3 g fiber, 7 g protein and *5 WW PointsPlus Value. Adapted from Alanna at Kitchen Parade who has a great post called How and Why to Cook Oatmeal Everyday that includes nine reasons why to cook it and four ways how to cook it for breakfast. If you’re watching your calories, here are some examples of 100 calorie topping you can add to your morning bowl of oatmeal. And don’t forget that with the Weight Watcher’s Points Plus Program any fresh or frozen unsweetened fruit you add has 0 points! Do you want a big bowl of oatmeal? Here’s a recipe from Hungry Girl that you’re sure to love. She calls it the HG Growing Oatmeal Bowl. The secret is to use twice as much liquid and cook it for twice as long as recommended. 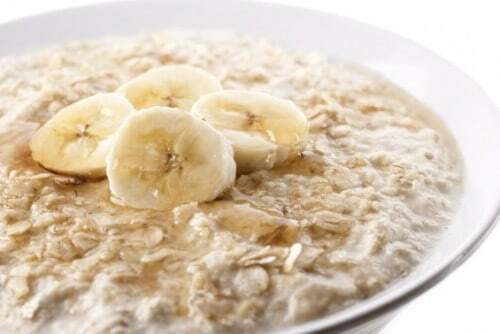 You end up with a gigantic bowl of oatmeal with around 200 calories! Combine all ingredients in a non-stick pot on the stove. Stirring often, cook until very thick and creamy, about 12 to 15 minutes. 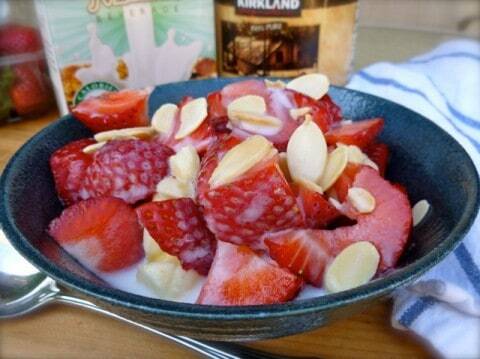 Need more ideas and suggestions for how to prepare you morning bowl of oats? Here’s a great collection of recipes that I’ve calculated the WW PointsPlus Values for. Enjoy! Ellie Krieger’s Vanilla Spice Oatmeal – with all the flavors of oatmeal cookies – raisins, walnuts, vanilla, cinnamon, nutmeg and brown sugar – this is healthy comfort food at it’s best. Each serving has 370 calories 13 g fat, 54 g carbs, 6 g fiber, 11 g protein and 9 WW PointsPlus Value. Found at The Food Network. Cinnamon Apple Spiced Oatmeal – topped with homemade apple butter, cinnamon and low fat granola with 229 calories and 6 PointsPlus Value found at SkinnyTaste. Cranberry Maple Slow Cooker Oatmeal – Simply stir the ingredients together before bed time and wake up to a comforting bowl of creamy, filling oats with 6 WW PointsPlus Value. Found at Weight Watchers. CrockPot Pumpkin Oatmeal – All of the autumn like flavors in this breakfast recipe with 161 calories and PointsPlus Value of 4 found at Laaloosh. Cinnamon Apple Raisin Slow Cooker Oats – a wonderful way to start the day with 208 calories and 5 WW Points+ found at AllRecipes. Healthy Toasted Oats with Berries – I’ve added a flavorful step of toasting the oats first before cooking in boiling water. In addition, I’m adding creamy vanilla soy milk, vanilla, cinnamon and fiber rich berries to create a wonderful flavor. Each serving has 215 calories and 5 WW PointsPlus Value. Found at Skinny Kitchen. Pumpkin Pie Oatmeal – What better way to start your day than with oatmeal with all the flavors of pumpkin pie. Each serving has 223 calories and 6 WW PointsPlus Value. Found at The Food Network. 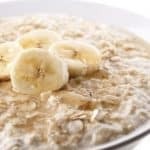 Overnight Slow Cooker Oatmeal – Here is an easy way to serve a crowd a hearty breakfast before facing the elements for a day of winter sports. You can assemble it in the slow cooker in the evening and wake up to a bowl of hot, nourishing oatmeal. With 193 calories and 4 WW PointsPlus Value. Found at Eating Well. Baked Oatmeal Recipes – A great roundup of tried and true baked oatmeal recipes from around the web with WW PointsPlus and calorie information. Skinny Banana Oatmeal Muffins & Quick Breads – A collection of delicious healthy muffin and breads with oatmeal and bananas. Summer Muesli Recipes – A great no-cook way to enjoy oats, especially during the warm summer months. Healthy Homemade Granola Recipe – Delicious slim and healthy granola sweetened with maple syrup. 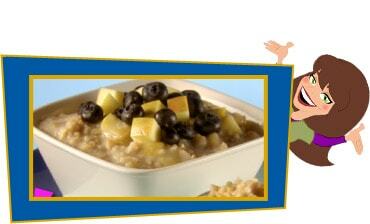 I was looking around for a good oatmeal photo and I came acoss your blog. Your post is terrific! It’s so information dense and your topping suggestions sound delicious. Great reference. I have lost 32 lb in the last 4 months and oatmeal has played a huge role in all my success but i was really running out of new oatmeal recipes. You have definitely fixed that problem. It’ll take me 4 more months just to try em all… yay! Thanx soooo much! You’re a life saver! Congratulations on your incredible weight loss! Here’s to oatmeal and all the delicious things you can do with it!! I love your recipes. Thank you for sharing. Instead of yogurt , I usually add 1 teaspoon of coffee mate. It’s only 10 calories… however you do not get the nutritional benefits of the yogurt! It is delicious though for a creamy texture.